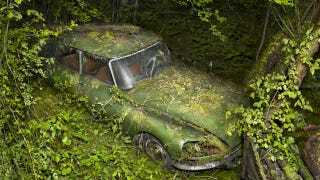 Alícia Rius has shown us what abandoned cars look from the inside. Peter Lippmann, an American photographer based in Paris, takes the opposite perspective. His series Paradise Parking shows cars in a rather more advanced state of decay than the cars in Rius’s From the backseat of my car, cars which are more greenery than steel, cars on their way to becoming earth-colored fossils like this Citroën DS, which could be mistaken for a peculiar French plant. Paradise Parking will be published as a book in October 2012.